Park People is a Toronto organization which advocates for better parks in all communities. Jill Cuthbertson and Shani Parsons attended their 2nd annual Park Summit to represent the Friends of Roxton Road Parks. Also in attendance were five city councillors (including Mike Layton) plus many City staff. 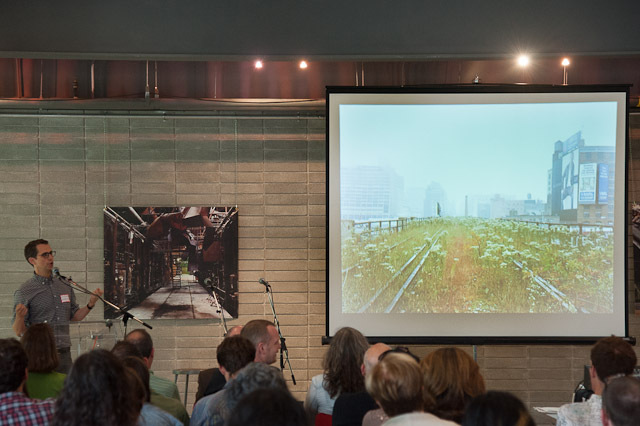 Below are notes from the inspiring presentations by David Harvey, Executive Director of Park People, Robert Hammond, co-founder of Friends of the High Line in New York City, and representatives from other Toronto parks which have had success in revitalization and community engagement. The Park People website has information on the Park Summit and a downloadable Park Friends Group Guidebook which gives great context to the work we are currently doing. City will be releasing a strategic plan for Parks due out this fall. Some of you may have filled out a questionnaire that formed part of the city’s community consultation. Harvey says the best parks are the ones with the most volunteers, not necessarily the ones with the most money. 2 dozen community meetings to present. We are not bound by what the community says, just listen and explain why yes or no. In 2005 did formal design competition. Lighting position and levels uniformly low (no bright, overhead lighting), allowing eyes to adjust to darkness is safer than blinding people every few feet, more pleasant, integrated appearance. Signage and Funder acknowledgments are deliberately low-key and integrated to minimize junking up the space with stuff no one reads. Recently added food concessions because this was overlooked during planning and they soon realized more people come to eat at the park than to exercise. There is no graffiti and park is very clean because of high usage/eyes on the park. Park ultimately did end up reflecting and serving the neighbourhoods that it passes through. Positive economic impact for the city at large was projected. Actual economic benefits to the City far surpassed anyone’s expectations.